On Monday morning, when I should have been working on the never ending to do list, my creative side took control and I found myself browsing the aisles of my favorite art supply store, Art Media. Came home with a few goodies, including a stack of silver metallic leaf. Couldn't wait to apply it to a painting or two. 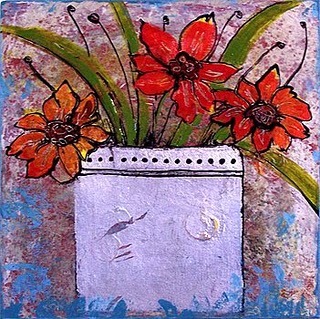 The flower container on this painting is created with the silver leaf. Unfortunately the camera doesn't pick up the beauty of the metallic. It really is a very thin, thinner than tissue paper, piece of faux silvery metal. At auction right now. Tomorrow, after I get it photographed, I'll show you the other painting that has the silver metallic leaf applied to it. Can't wait for you to see it!